The Gardenex export federation has been successful in securing cash grant funding for four major international garden trade exhibitions in the Government’s latest bidding round. The funding is available to eligible SMEs under the DIT’s Tradeshow Access programme and will enable British companies to exhibit their products to international markets in a cost-effective way, while also benefiting from the wide range of practical research, logistical and promotional support offered by the Federation. In addition to the shows in the US, Germany and Japan - where Gardenex has extensive experience of organising exhibitor-groups - the federation has secured funding for Myplant & Garden which is held in Milan, Italy (in Spring 2019). 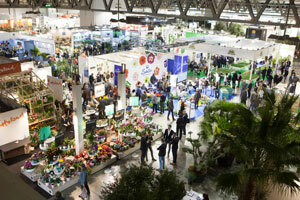 It is the first time that TAP funding has been offered for a British group at an Italian garden trade show. The decision to include Myplant & Garden on the April 2018 - March 2019 schedule follows a scoping visit by Gardenex earlier this year, when it was recognised that the show offers considerable opportunities for suppliers of both plants and hard goods. At the National Hardware Show (NHS) in Las Vegas (8-10 May 2018), the Federation will be organising the British pavilion for the 24th time. The NHS attracts over 30,000 industry professionals, including 2,600 exhibitors from the lawn and garden, hardware and DIY industries. Exhibiting in the Gardenex-organised group at the NHS offers a significant opportunity for British suppliers to reach the largest garden market in the world. Firms that have participated in the group at previous editions of the show have signed significant export orders, and the fact that the federation has secured a prime location for the British pavilion in 2018 should ensure a continuation of those successes. The major international garden and leisure trade show, Spoga+gafa in Cologne (2-4 September 2018) also appears on the 2018 Gardenex exhibition schedule. Spoga+gafa is Europe’s largest trade show covering all sectors of practical, decorative and leisure gardening products. Gardenex has nearly 50 years’ experience of exhibiting at the show, during which time the UK firms participating in the British pavilion have secured many millions of pounds worth of export business for the UK. In 2017, around 39,000 trade visitors from around 113 countries attended the exhibition. The Federation’s experience in the Japan market also dates back for many years, and in 2018 British firms have the opportunity of exhibiting in the Gardenex group at Gardex/Ifex in Tokyo (10-12 October 2018). Gardex/Ifex is Japan's leading garden industry trade show and is regarded as the best sourcing venue for the following spring gardening seasons among Japanese buyers. The show now serves as the gateway to the Japanese market for overseas garden products exporters. Almost all the Japan's leading home center buyers visit the show every year and these are joined by other retail outlets such as garden centres and garden shops, as well as wholesalers, importers, growers, landscapers and many more. The schedule to March 2019 will culminate in the exhibitor pavilion at Myplant & Garden, which is held in Milan in Spring (2019 show dates to be confirmed). Full details on these initiatives will issued throughout the year but in the meantime interested companies should contact Gardenex to register their interest and to obtain full information on the comprehensive range of export advice, market research, sales leads and practical advice available to member companies.